Today marks 12 months since changes were made to the immigration rules for migrant domestic workers. These changes followed the independent review by James Ewins who was asked to assess how far the then existing arrangements for workers were effective in protecting them from abuse. One of the main recommendations in the review and accepted by the government, was the introduction of group information meetings. These should provide a safe, comfortable and confidential space for workers to get independent information, advice and support concerning their employment and immigration rights while at work in the UK. They are also an opportunity for workers to come together, socialise and share their experiences with each other. More than 12 months have passed since the government responded to the independent review and made changes to the immigration rules. During this time approximately 17,000 domestic workers will have arrived in the UK to work for their employer. Regrettably the government has still to implement the information meetings so workers remain uninformed of their rights in the UK. Unfortunately the changes made to the immigration rules are of no worth to domestic workers who are not aware of and are able to enforce their rights. In the last 12 months Kalayaan has continued to register domestic workers who are unaware of the terms of their visa, including the right to change employer and that this is not conditional upon proving abuse. Workers report not knowing what the National Minimum Wage is, that they should retain control of their passport, have a copy of their employment contract and have access to healthcare. One of these clients was Leela who arrived in the UK on a domestic worker visa issued after April 2016. Leela was forced to accompany her employer to the UK as she was tied under the kafala system in Saudi Arabia which prevents workers from leaving their employers without their permission. Leela sought work abroad to help support her family who are reliant on her remittances to pay for basic essentials including food, clothes and rent. After Leela arrived in the UK, her passport was taken from her. She stayed with her employer and their family in a hotel in London. She slept on the floor and was given no food to eat. She was responsible for her employer’s children and expected to be on call 24/7. She was not allowed outside unaccompanied. She survived by stealing the children’s food. She was never paid for her work as her employer told her it had cost a lot of money to bring her to the UK. Leela decided to run away as she could no longer endure working long hours with no food and no money. When Leela came to Kalayaan she did not know she had the right to leave her employer and work for someone else. She says if she had known she had rights, she wouldn’t have tolerated her treatment and would have left her abusive employer a lot earlier. Kalayaan has been informed that the government cannot make information meetings compulsory as there is no provision in law to make it a condition of the visa. The effect of this means that those who have no or severe restrictions placed on their freedom, those who need this information most, will not be in a position to attend which undermines the reasons behind introducing information meetings. This is at complete odds with the recommendation made in the independent review which discusses why a voluntary system would be wholly inadequate and why all evidence points to a mandatory condition to ensure workers fundamental rights are protected. For more information please contact Avril Sharp at Kalayaan: avril@kalayaan.org.uk. 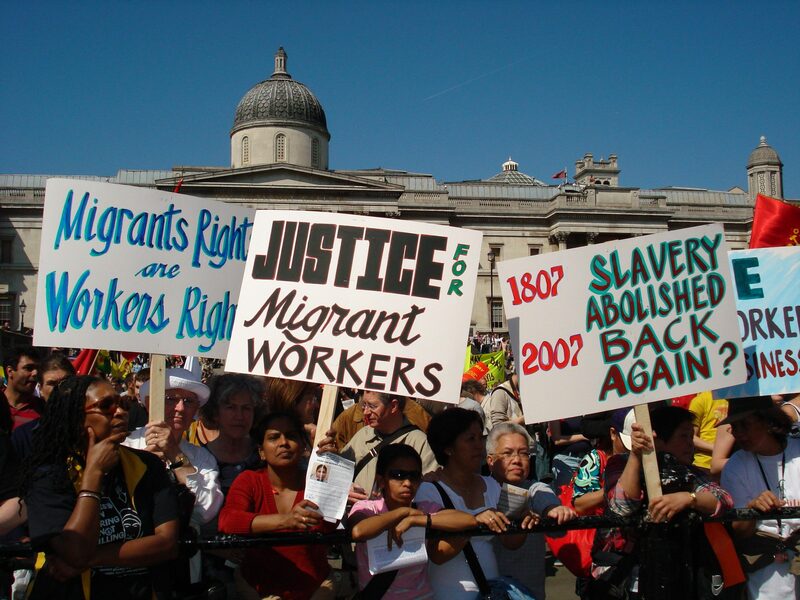 Kalayaan was established in 1987 to provide advice, advocacy and support services in the UK for migrant domestic workers. We are NOT involved in helping people to come to the UK from another country. Migrant domestic workers are people who have entered the UK legally with an employer on a domestic worker visa to work in a private household. The information in this website is for general guidance on your rights and responsibilities as a domestic worker in the UK and is not intended as legal advice on specific situations and should not be relied on as a source of legal advice. If you need more details on your rights or legal advice about what action to take, please contact Kalayaan or a solicitor. Kalayaan endeavours to ensure the content of this website is accurate and up to date but does not accept any liability any loss, damage or inconvenience arising as a consequence of any use of or the inability to use any information on this website. Kalayaan accepts no responsibility for the contents of linked websites. Links should not be taken as endorsement of any kind. Kalayaan has no control over the availability of the linked pages. Content on this site is protected by copyright. The copyright owner is Kalayaan. You may not make alterations or additions to the material on this site, or use it for commercial purposes.